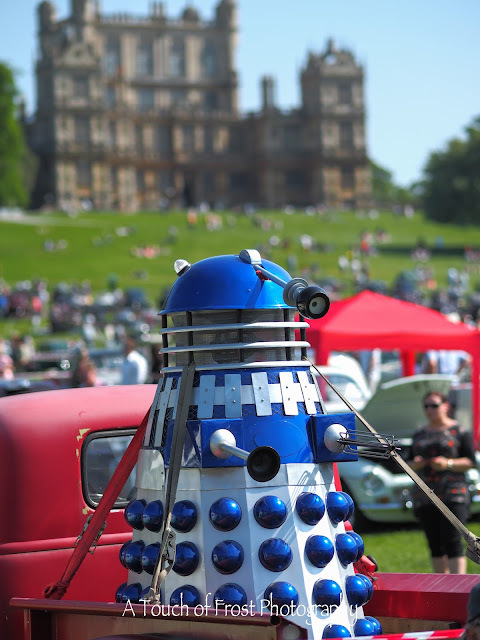 A grand day, so I drove over to Wollaton Park to see the annual car show, that happens on the first weekend of June. As it was such a lovely day, there seemed to be a thousand cars to look at, both old and new. Some quite common like the Mini, to some really rare and valuable vehicles, that would set you back many thousands of pounds. But me being me, I wanted to find something unusual to take. So what about a Dalek, strapped to an old American pick up truck? Now that's different. I have no idea about the what and why's, but it makes for an interesting photo, especially with Wayne Manor in the background.